© Silveira and Mucha; Licensee Bentham Open. In this study, we aimed highlight some clinical features present in patients whose maxillary lateral incisors are missing, and proposed more logical, rational and predictable solutions to inform decision making in rehabilitation procedures. Choosing the best possible treatment for congenital absence of maxillary lateral incisors depends on the multidisciplinary diagnosis of facial, occlusal, functional and periodontal features. It also depends on the individual long-term stability, and it does not only rely on canine-guided disocclusion. Keywords: Dental implant, dental prosthesis, lateral incisor, orthodontic space closure, tooth agenesis. Upper lateral incisors agenesis affects approximately 2% of population. Bilateral cases are more common than unilateral, and women have a slightly higher prevalence than men [1, 2]. This is a condition that involves the anterior dental arch region; therefore, it raises concern in patients and their families considering that diastemata, mesially positioned canines, and dental asymmetries significantly compromise facial esthetics, particularly the smile [3, 4]. Since the 1970s, because of advances in dental materials used to bond to the tooth structure and osseointegration with dental implants, there are more therapeutic options available for addressing the problem of missing upper lateral incisors. Nowadays, many alternatives exist, including removable partial denture , conventional fixed partial denture [4, 5], fixed partial denture in cantilever , adhesive denture [4-6], implant-supported denture , and orthodontic space closure followed by dental recontouring [3-5]. Despite all these treatment modalities, considering the position of the maxillary canine in normal occlusion with the lower canine as a therapeutic goal to ensure canine guidance has prompted much controversy and debate [3-5, 8-10]. Regardless of the type of prosthetic replacement, this consists in opening or at least maintaining the space between missing teeth. The canine would then be placed or kept in an Angle Class I relationship, according to the gnathological principles of an ideal or pure lateral disocclusion via the canines . Space closure is achieved by moving cuspid to mesial. Moreover, the loss of canine guidance during lateral movements of the mandible finds greater acceptance among orthodontists than dentists and specialists of dental restoration [12, 13]. 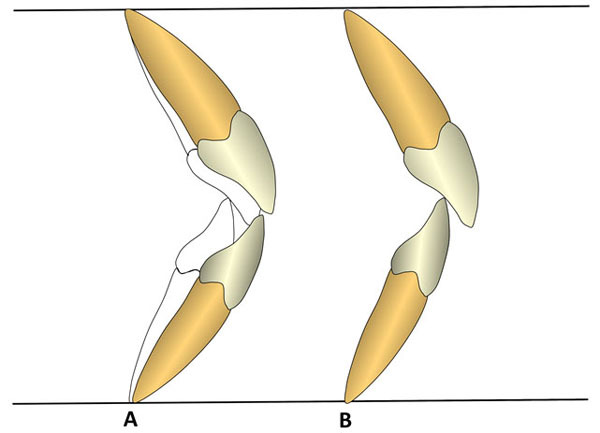 Thus, it is important to understand whether the disocclusion of canines through functional lateral movements always represents the main goal when designing a multidisciplinary approach to address the agenesis of maxillary lateral incisors. The aim of this article was to highlight and discuss some of the features present in certain clinical situations, such as those where facial esthetics, periodontal integrity, and even an optimum functional occlusion should be prioritized over a canine protected occlusion. Ideal position of the upper and lower lips with respect to the Steiner (“S”) line (obtained from the midpoint of the lower contour of the nose to the most anterior point on the chin). Teenagers with late mixed dentition or newly developed permanent dentition are often seeking treatment for congenital absence of maxillary lateral incisors, because during this period the esthetic problem becomes more evident [3, 14-17]. The professional’s decision to maintain or open the space through orthodontic correction implies waiting the end of craniofacial growth before completing a definitive rehabilitation treatment, particularly if this is an implant-supported prosthesis [18-22]. During this period that can last several years, a temporary (preferably fixed) prosthodontics should be installed in those cases scheduled for implant placement [7, 10, 23]. The longer the time elapsed between the completion of orthodontic treatment and placement of the implant, the greater the risk of atrophy of the alveolar ridge  and the roots adjacent to the space moving once again closer together . In the first case, additional bone graft surgical procedures may be necessary ; in the second one, a fixed orthodontic appliance may have to be placed once more, to restore parallelism and adequate space between the roots of the teeth adjacent to the future implant recipient bed . On the other hand, implant restorations in the anterior maxilla represent a challenge in terms of proper esthetic results, particularly in the gingival contour aspect [19, 20, 25]. And even when a good immediate result is achieved [26, 27], one can expect that, over the years, there will be misalignment, both gingivally and on the incisal edge, between the implant crown and the teeth adjacent to it resulting from the continuous eruption of natural teeth [19, 20, 28]. In addition, the incisors will be uprighted over the years, which can cause a virtual protrusion of the implant crown [26, 29]. In contrast, closure of the orthodontic space through mesially moved canine can be performed even before the end of dental development, because it takes advantage of the flexibility and metabolism of young, growing bones [9, 16]. The key word is result “predictability” thanks to the treatment option involving space closure and the use of natural teeth [16, 25]. In addition, it is important that the treatment ends during adolescence, as this exerts a positive impact on individual self-esteem and social acceptance without the need to use temporary prosthodontics . Diagnosis and orthodontic planning should have several goals, including improved appearance (esthetics), normal oral function, optimum proximal and occlusal contacts (occlusion), and long-term stability . The esthetic analysis necessary for decision-making should not be restricted only to structures framed by the lips on smiling nor should it be limited to the frontal view. Evaluations of the face in profile with the lips at rest have been widely employed in orthodontic diagnostic procedures since the dawn of orthodontics . Beside the full facial orthognathic profile, the lower face should also be considered. 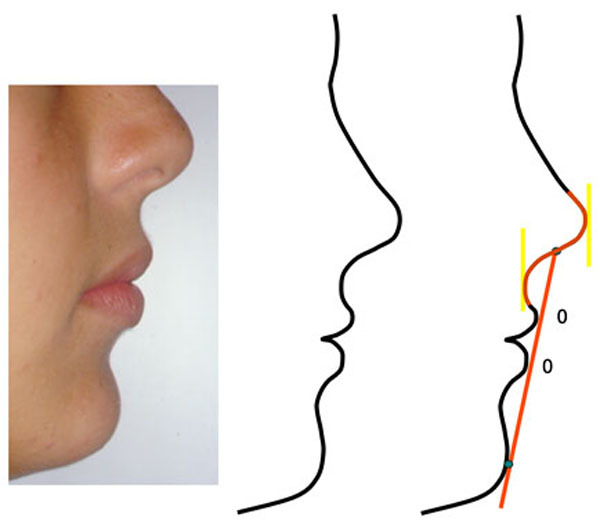 The relationship between nose, chin, and mouth can be easily analyzed by lines such as the Steiner (“S”) Steiner line , and the ideal situation would be the one where the most anterior points of both lips are touching this line (Fig. 1). When the lips are positioned posterior to the “S” line, a concave aspect of the lower face emerges, which is typical of senility. In contrast, when the lips appear anterior to this line, the lower face profile looks full, protrusive, and convex. From an esthetic point of view, situations of extreme concavity or protrusion are equally unpleasant, and often lead patients and their legal guardians to seek correction with an orthodontist . The position of the lips on the face is directly related to the anteroposterior one of the incisors. Retraction or dental protrusion through orthodontic mechanics causes changes in the lips to a greater or lesser degree, depending on ethnicity, gender, and/or the type of sagittal malocclusion . The relationship between incisors and lips retraction is approximately 3.0 mm from the upper incisor to 1.0 mm for the upper lip (3:1), and 1:1 for the lower incisor and lower lip . The presence of lip biprotrusion accompanied by dental biprotrusion may be the patient’s chief complaint (Fig. 2). Extraction of teeth in the mandibular arch (bicuspids) through bimaxillary dental retraction is indicated in individuals with congenital absence of maxillary laterals to achieve lip retraction and a balanced facial relationship [14, 25, 36]. In these cases, it would be contraindicated to extract premolars in view of the absence of upper lateral incisors. Furthermore, it does not seem reasonable to trade two natural teeth for two lateral incisor prostheses just to keep the canines in Class I. There are clinical situations where a biprotrusion is accompanied by reduced overbite, thereby compromising the effectiveness of the anterior guidance. The closure of upper spaces (or agenesis spaces) and, in some cases the extraction of lower teeth (premolars), can also be justified, because retraction increases overbite (Fig. 3), thus enabling a proper anterior disocclusion of the mandibular protrusive movements [37, 38]. In biprotrusion cases that compromise facial esthetics, anterior disocclusion is preferable to lateral canine disocclusion, as it can be satisfactorily replaced by group function [39-42]. The anterior guidance, on the other hand, can only be performed by anterior teeth that, after treatment, exhibit adequate overbite and overjet. Therefore, both the maintenance and the opening of space would be contraindicated in cases of lip and dental biprotrusion and, consequently, when the goal is to address this issue. In cases with a severe lack of space in the lower dental arch, it is mandatory to indicate dental extractions, irrespective of other features the patient may present [31, 32, 38]. Often, the alveolar bone positioned buccally to the incisors becomes increasingly thinner due to protrusion and the buccal position of these teeth..., and may even have ...gingival recessions, fenestration and bone dehiscence . In such cases, facial esthetics may also be compromised . When upper lateral incisors are missing and there is an appropriate maxillomandibular sagittal relationship of the posterior segments (i.e., molars in Class I, or next to a Class I Angle relationship), the preferred option is to extract the mandibular first premolars while closing both upper and lower spaces [14, 36]. Angle Class II malocclusion is characterized by a more anterior position of the maxillary dental arch relative to the mandibular one. It may also result from a more anterior position of the upper arch, a more posterior position of the lower arch, or a combination of both. Furthermore, these deviations may be located only in the dental aspect or as secondary signs of disharmony between the bony bases of the maxilla versus the mandible, which is characteristic of a skeletal origin malocclusion . Case with dental biprotrusion before and after correction, showing excellent esthetic results of the facial profile contour. One of the strategies to treat Angle Class II malocclusion through maxillary protrusion, particularly in patients at the end of growth or with no growth, is to extract teeth in the upper arch, usually the first bicuspids so to create space for retraction of these teeth  and obtain adequate overjet and overbite (Fig. 4). In Class II malocclusions with congenital absence of the upper lateral incisors and no crowding in the lower arch, the use of existing spaces to retract the upper anterior teeth, central incisors, and canines is more conservative and predictable. Moreover, it requires less total treatment time than the maintenance of spaces for prostheses of the lateral incisors and extraction of the maxillary first premolars [14, 36]. This situation poses a daunting challenge to dental professionals, namely when the treatment of missing teeth is undertaken in the anterior maxilla. The major concerns consist in imparting a harmony of color and hue to the teeth, appropriate gingival contour, and natural topography of the alveolar process [17, 19, 20]. At present, the first prosthetic treatment option for cases of missing teeth is the implant . Gingival recession is commonly found in adults, where it may give rise to color change in the marginal gingiva (bluish hue) and/or exposure of the implant edge . In addition, over time, it is possible that the implant crown and the crowns of the other teeth become unlevelled in both the gingival and incisal aspects, as the implant tends to behave like an ankylosed tooth [9, 19, 20]. These limitations are particularly important in patients with gingival exposure on smiling, thus implants are not indicated in these cases [9, 25]. 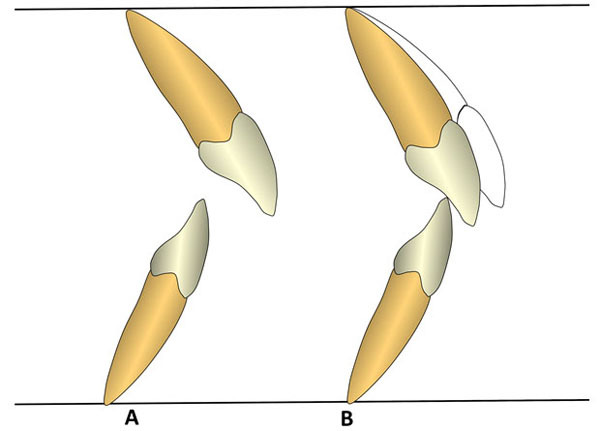 The uprighting of protrusive incisors (A) provides optimum overbite with excellent incisal guidance (B). In tooth-supported fixed dentures, the presence of a depression in the alveolar ridge in the edentulous region, which results from a growing bone atrophy over the years, should not be disregarded from an esthetic point of view [24, 46]. Moving canine to mesial, in order to close the spaces left by missing teeth, leads to great esthetic advantages compared to other options. However, it is important that orthodontists perform canine extrusion to allow a lower gingival contour relative to the central incisor and the first premolar, and apply a lingual root torque to these teeth to prevent the emergence of a canine eminence in the lateral incisor region [14, 17]. Given that all the teeth are natural, eruption will occur jointly and the teeth will remain leveled . In the presence of a deep bite and when the intrusion of the maxillary central incisors is proposed as orthodontic treatment, maintenance or opening spaces for replacement with implants should be cautiously reassessed, as some intrusion relapse will manifest in the future [47, 48], and the esthetic result can be catastrophic in the long term [19, 20], particularly if a slight gummy smile is present [9, 17]. When fixed dentures have already been planned, situations of unilateral agenesis should raise concern, because the two central incisors may become unlevelled as the central incisor on the side unaffected by agenesis are free to express recurrence and the central incisor adjacent is fixed to the canine by means of a fixed partial denture. Therefore, the best suited treatment option seem to be the mesially moved canines, as they are natural teeth whose mechanical behavior is similar to that of incisors. Another option would be to bond a retainer on the palatal side not only to prevent the opening of space but also to maintain the leveling of the recontoured central incisors and canines [9, 15, 17]. According to articles published by gnathologists, pure lateral disocclusion via canines (i.e., canine unilateral contact on the working side) is ideal for maintaining homeostasis of the stomatognathic system. Therefore, the whole rehabilitation treatment with prosthodontics or orthodontics should aim to set such lateral disocclusion whenever possible [49, 50]. In situations where the malocclusion does not allow to achieve a canine protected occlusion (CPO), a group function would be acceptable, if contacts and prematurities are not present on the balancing side . But for orthodontists, who treat malocclusions, obtaining this type of lateral disocclusion at the end of treatment would be tacit, at the risk of the professional being accused of not practicing state-of-the-art orthodontics [40, 51]. The criterion for the acceptance of specific type of disocclusion (i.e., canine protected occlusion) as the ideal should be based on the premise that it is more prevalent in nature and that these individuals display fewest TMD signs and symptoms and less periodontal impairment [40, 51]. Class II case (A), where closure space results in adequate overjet and overbite (B). However, studies on the prevalence of the different types of lateral disocclusion show divergent distributions for balanced occlusion, canine protected occlusion, group function and mixed occlusion (i.e., protected by the canine in a group function) . The presence of balanced occlusion, namely bilateral contacts during mandibular lateral movement, range from 34% to 89% in untreated individuals with different malocclusions. Therefore, there is no such thing as a predominant functional occlusion in nature . In addition, the superiority of any type of occlusal function to improve or prevent TMD problems has not been demonstrated yet [4, 40, 52]. The etiology of TMD is known to be multifactorial, and static, functional occlusion plays only a secondary role [40-53]. Occlusal factors may also contribute to TMD, but only very slightly (10% to 20%) without, however, being directly connected in a cause-and-effect relationship . Another point that should be addressed is the instability of CPO over the years. Canine protected occlusion tends to be replaced by group function due to an inevitable and rather common wear of maxillary canines [40, 54]. Concerning the treatment of agenesis of lateral incisors, studies [4, 5] compared occlusion in cases subjected to space closure through canine mesialization versus space maintenance followed by prosthetic replacement. A comparison of sagittal, vertical, and lateral discrepancies between centric relation (CR) and centric occlusion (CO), occlusal contacts in CO, and premature contacts on the balancing side showed no significant differences. The presence of signs and symptoms of temporomandibular disorders and the prevalence of gingival recession on the buccal surfaces of the premolars were no different [4, 5, 55]. There is no strong or irrefutable evidence to prove that the relentless pursuit of canine protected occlusion is beneficial for all orthodontic patients, particularly those with missing maxillary lateral incisors . Treating maxillary lateral incisor agenesis requires the joint work of a multidisciplinary team that, after evaluating all parameters of oral health, facial esthetic, dental and smile esthetics, occlusal, functional, periodontal, and stability, decides to adopt a therapeutic modality that offers the best biological cost-effectiveness in terms of time and financial support for the patient, that is, the most effective treatment. Space closure in young patients is very often the procedure of choice, as it is reversible and thus provides future options and esthetic considerations. Occlusion through canine guidance is not an absolute condition for maintaining the balance of the stomatognathic system, as it may well be replaced by group function. This simplistic approach is not supported by scientific evidence but by dogmatic beliefs. Stamatiou J, Symons AL. Agenesis of the permanent lateral incisor: distribution, number and sites. J Clin Pediatr Dent 1991; 15(4): 244-6. Aasheim B, Ögaard B. Hypodontia in 9-year-old Norwegians related to need of orthodontic treatment. Scand J Dent Res 1993; 101(5): 257-60. Araújo EA, Oliveira DD, Araújo MT. Diagnostic protocol in cases of congenitally missing maxillary lateral incisors. World J Orthod 2006; 7(4): 376-88. Robertsson S, Mohlin B. The congenitally missing upper lateral incisor. A retrospective study of orthodontic space closure versus restorative treatment. Eur J Orthod 2000; 22(6): 697-710. Nordquist GG, McNeill RW. Orthodontic vs. restorative treatment of the congenitally absent lateral incisor--long term periodontal and occlusal evaluation. J Periodontol 1975; 46(3): 139-43. Kinzer GA, Kokich VO Jr. Managing congenitally missing lateral incisors. Part II: tooth-supported restorations. J Esthet Restor Dent 2005; 17(2): 76-84. Kinzer GA, Kokich VO Jr. Managing congenitally missing lateral incisors. Part III: single-tooth implants. J Esthet Restor Dent 2005; 17(4): 202-10. Senty EL. The maxillary cuspid and missing lateral incisors: esthetics and occlusion. Angle Orthod 1976; 46(4): 365-71. Zachrisson BU, Rosa M, Toreskog S. Congenitally missing maxillary lateral incisors: canine substitution. Point. Am J Orthod Dentofacial Orthop 2011; 139(4): 434-445, 436, 438 passim. Kokich VO Jr, Kinzer GA, Janakievski J. Congenitally missing maxillary lateral incisors: restorative replacement. Counterpoint. Am J Orthod Dentofacial Orthop 2011; 139(4): 435-445, 437, 439 passim. D’Amico A. The canine teeth-normal functional relation of the natural teeth of the man. J Southern California D A 1958; 26: 194-208. Rinchuse DJ, Kandasamy S, Sciote J. A contemporary and evidence-based view of canine protected occlusion. Am J Orthod Dentofacial Orthop 2007; 132(1): 90-102. Louw JD, Smith BJ, McDonald F, Palmer RM. The management of developmentally absent maxillary lateral incisors--a survey of orthodontists in the UK. Br Dent J 2007; 203(11): E25. Tuverson DL. Orthodontic treatment using canines in place of missing maxillary lateral incisors. Am J Orthod 1970; 58(2): 109-27. Al-Anezi SA. Orthodontic treatment for a patient with hypodontia involving the maxillary lateral incisors. Am J Orthod Dentofacial Orthop 2011; 139(5): 690-7.
 dos Santos-Pinto A, Raveli DB, Chiavini PC, Paulin RF, Jacob HB. Tratamento de ausência congênita de incisivo lateral superior por meio da recuperação de espaço para colocação de implante dentário ou fechamento de espaços - Relato de casos. Rev Dent Press Ortodon Ortop Facial 2002; 7: 65-77. Rosa M, Zachrisson BU. Integrating esthetic dentistry and space closure in patients with missing maxillary lateral incisors. J Clin Orthod 2001; 35(4): 221-34. Fudalej P, Kokich VG, Leroux B. Determining the cessation of vertical growth of the craniofacial structures to facilitate placement of single-tooth implants. Am J Orthod Dentofacial Orthop 2007; 131(4)(Suppl. ): S59-67. Jemt T, Ahlberg G, Henriksson K, Bondevik O. Changes of anterior clinical crown height in patients provided with single-implant restorations after more than 15 years of follow-up. Int J Prosthodont 2006; 19(5): 455-61. Thilander B, Ödman J, Jemt T. Single implants in the upper incisor region and their relationship to the adjacent teeth. An 8-year follow-up study. Clin Oral Implants Res 1999; 10(5): 346-55. Bernard JP, Schatz JP, Christou P, Belser U, Kiliaridis S. Long-term vertical changes of the anterior maxillary teeth adjacent to single implants in young and mature adults. A retrospective study. J Clin Periodontol 2004; 31(11): 1024-8. Mucha JN. Entrevista. Rev Dent Press Ortodon Ortop Facial 2004; 9: 19-28. Olsen TM, Kokich VG Sr. Postorthodontic root approximation after opening space for maxillary lateral incisor implants. Am J Orthod Dentofacial Orthop 2010; 137(2): 158.e1. Beyer A, Tausche E, Boening K, Harzer W. Orthodontic space opening in patients with congenitally missing lateral incisors. Angle Orthod 2007; 77(3): 404-9. Krassnig M, Fickl S. Congenitally missing lateral incisors--a comparison between restorative, implant, and orthodontic approaches. Dent Clin North Am 2011; 55(2): 283-299, viii. Chang M, Wennström JL, Odman P, Andersson B. Implant supported single-tooth replacements compared to contralateral natural teeth. Crown and soft tissue dimensions. Clin Oral Implants Res 1999; 10(3): 185-94. Dueled E, Gotfredsen K, Trab Damsgaard M, Hede B. Professional and patient-based evaluation of oral rehabilitation in patients with tooth agenesis. Clin Oral Implants Res 2009; 20(7): 729-36. Iseri H, Solow B. Continued eruption of maxillary incisors and first molars in girls from 9 to 25 years, studied by the implant method. Eur J Orthod 1996; 18(3): 245-56. Björk A, Palling M. Adolescent age changes in sagittal jaw relation, alveolar prognathy, and incisal inclination. Acta Odontol Scand 1955; 12(3-4): 201-32. Hobkirk JA, Goodman JR, Jones SP. Presenting complaints and findings in a group of patients attending a hypodontia clinic. Br Dent J 1994; 177(9): 337-9. Ackerman JL, Nguyen T, Proffit WR. Orthodontics: current principles and techniques. Philadelphia: Elsevier Mosby 2012; pp. 1-58. Case CS. The Question of Extraction in Orthodontia. Dent Cosmos 1906; 48: 521-8. Steiner CC. The use of cephalometrics as an aid to planning and assessing orthodontic treatment. Am J Orthod 1960; 46: 721-35. Hier LA, Evans CA, BeGole EA, Giddon DB. Comparison of preferences in lip position using computer animated imaging. Angle Orthod 1999; 69(3): 231-8. Hayashida H, Ioi H, Nakata S, Takahashi I, Counts AL. Effects of retraction of anterior teeth and initial soft tissue variables on lip changes in Japanese adults. Eur J Orthod 2011; 33(4): 419-26. Kokich VO Jr, Kinzer GA. Managing congenitally missing lateral incisors. Part I: Canine substitution. J Esthet Restor Dent 2005; 17(1): 5-10. Hans MG, Groisser G, Damon C, Amberman D, Nelson S, Palomo JM. Cephalometric changes in overbite and vertical facial height after removal of 4 first molars or first premolars. Am J Orthod Dentofacial Orthop 2006; 130(2): 183-8. Travess H, Roberts-Harry D, Sandy J. Orthodontics. Part 8: Extractions in orthodontics. Br Dent J 2004; 196(4): 195-203. MacMillan HW. Unilateral vs bilateral balanced occlusion. J Am Dent Assoc 1930; 17: 1207-20. Ash MM, Ramjford S. Occlusion. 4th ed. Philadelphia: W B Saunders Company 1996. Isaacson D. A biologic concept of occlusion. J Prev Dent 1976; 3(5): 12-6. Barbosa VL. Angle Class I malocclusion treated with lower incisor extraction. Dental Press J Orthod 2013; 18(3): 150-8. Henry RG. A classification of Class II, Division 1 malocclusion. Angle Orthod 1957; 27: 83-92. Tadic N, Woods MG. Incisal and soft tissue effects of maxillary premolar extraction in class II treatment. Angle Orthod 2007; 77(5): 808-16. Al-Buraiki H, Sadowsky C, Schneider B. The effectiveness and long-term stability of overbite correction with incisor intrusion mechanics. Am J Orthod Dentofacial Orthop 2005; 127(1): 47-55. Thilander B, Ödman J, Lekholm U. Orthodontic aspects of the use of oral implants in adolescents: a 10-year follow-up study. Eur J Orthod 2001; 23(6): 715-31. D’Amico A. The canine teeth: normal functional relation of the natural teeth of man. J S Calif Dent Assoc 1958; 26: 6-23. Roth RH. The maintenance system and occlusal dynamics. Dent Clin North Am 1976; 20(4): 761-88. Tipton RT, Rinchuse DJ. The relationship between static occlusion and functional occlusion in a dental school population. Angle Orthod 1991; 61(1): 57-66. McNamara JA Jr, Seligman DA, Okeson JP. Occlusion, Orthodontic treatment, and temporomandibular disorders: a review. J Orofac Pain 1995; 9(1): 73-90. Meng HP, Dibbets JM, van der Weele LT, Boering G. Symptoms of temporomandibular joint dysfunction and predisposing factors. J Prosthet Dent 1987; 57(2): 215-22. Storey AT. Functional stability of orthodontic treatment: occlusion as a cause of temporomandibular disorders. In: Nanda R, Burstone CJ, Eds. Retention and stability in orthodontics. Philadelphia: W B Saunders Company 1993; pp. 203-15. Marchi LM, Pini NI, Hayacibara RM, Silva RS, Pascotto RC. Congenitally missing maxillary lateral incisors: functional and periodontal aspects in patients treated with implants or space closure and tooth re-contouring. Open Dent J 2012; 6: 248-54.